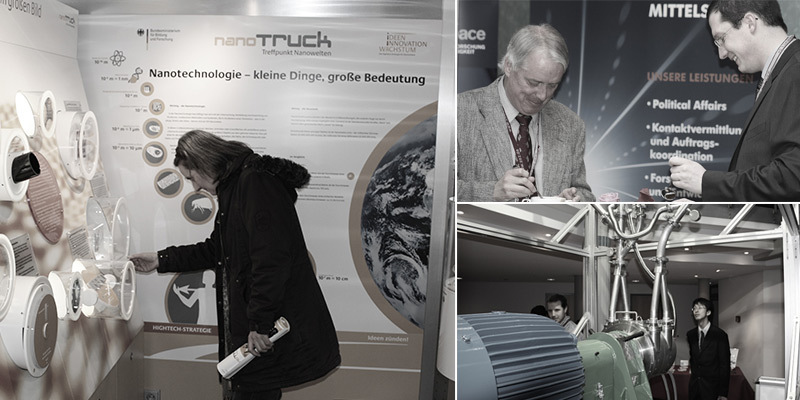 The OZ-Exhibition that will be held in conjunction with the Symposium offers an excellent opportunity for international suppliers to the nanostructure-related industry to make new contacts and to win business potential. Within the OZ-philosophy, the integrated exhibition is not a funding but an important enrichment and contribution to the entire event and is therefore free of charge. In particular table-top exhibitions are very welcome where we will be happy to supply tables, chairs, standard electricity, wireless LAN access, students helping hands etc. in the exhibition area which will also be free of charge. Also, upon inquiry and confirmation, you are very much invited to bring your booth and large equipment to OZ-18. Since the exhibition area is right in front of the conference auditorium, please help us to arrange a good meeting on time by obeying the published exhibition set-up and turn-down times. On site you will always find helping hands and in case you need us to supply a table and one or two chairs, please just let us know at OZ@zoz.de. All these services are free of charge of course. We will work out a floor plan which might come up only one or two days prior OZ-18 starts. For now, please notice that space is limited per exhibitor to 5 square meters at a height of 3 meters. Exceptions are possible upon inquiry at OZ@zoz.de. We will have electricity available for simple illumination. In case you want to operate some equipment, please contact us at OZ@zoz.de. Power supply then might not be free of charge. If possible, please bring your own extension cords for about 20 meters in case you want to use some illumination at your booth. In case you want to bring your booth and/or exhibit large equipment, there is some limited space available and insofar please contact us for confirmation and inquiry at OZ@zoz.de. In case you want to exhibit vehicles outside, the plaza in front of the venue is available upon inquiry at OZ@zoz.de. Please state the details of what you would like during the registration.